The Thyssen Art Macabre Ritz Newspaper etc. etc. 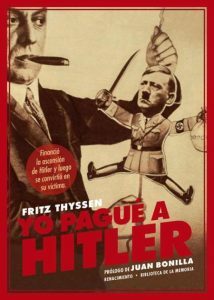 First published in 1941, the book ‘I Paid Hitler’, whose authorship Fritz Thyssen both claimed and denied at different times, has recently been republished in Spain by Editorial Renacimiento of Seville, with a foreword by Juan Bonilla, under the title ‘Yo Pagué a Hitler’. Seventy-six years ago, the work was brokered, edited and largely written by a highly intelligent Jewish, formerly Hungarian literary hustler by the name of Emery Reves (Imre Révész), who made a great deal of money from such things; much of it from subsequently representing Winston Churchill’s literary and journalistic endeavours. With the encouragement of Reves, the considerably less intelligent Fritz Thyssen attempted to convince his readers that he deserved admiration for his courage in opposing allied First World War reparation demands on Germany. He also craved a sympathetic understanding for his financial support of Hitler as a means of preventing the spread of communism, as well as an acceptance of the notion that he had rejected the Third Reich when he realised the truth of its ambitions in late 1939. This initial ploy, however, remained largely unsuccessful, as the book was dismissed by many as delusional, self-protective propaganda. Meanwhile, Fritz, eager to cultivate what he saw as his new-found status of international, political celebrity, had given up his plans of escaping to Argentina (the anonymity of which he feared) and remained in Europe. But, courtesy of the Gestapo, by late 1940 he found himself back in Nazi Germany – together with his wife – where they would be held quite comfortably, first in a private sanatorium and, from 1943 onwards, in the VIP sections (!) of various concentration camps. Today, at a time when the Fritz Thyssen Foundation of Cologne (founded in 1959 by Fritz Thyssen’s widow Amelie Thyssen as a memorial and tax efficient means of cultivating academic favour by providing financial support for research projects), is busy funding an academic rewriting of the Thyssen corporate and familial history, the reappearance of the book ‘I Paid Hitler’ could prove somewhat of an embarrassment. Indeed, they have already acknowledged the fact that a number of the statements in the work are, in fact, untrue! So why now? And why in Spain? It could thus seem reasonable to assume that, given the fact the Zichy-Thyssens have achieved very little in their lives apart from fortuitous parental choice, resulting in their exceptional wealth, they might have been responsible for funding this latest publishing venture. Well, having been raised in Argentina, the Zichy-Thyssens’ grasp of the Spanish language is somewhat better than their obviously tenuous grasp of English. It should also, perhaps, not be forgotten that the Third Reich was partially responsible for General Franco’s success in the Spanish Civil War and the resulting subjugation of the population to fascist rule, which lasted well into the 1970s. There must still be many Spanish who remain sympathetic to the likes of Fritz Thyssen and of his family’s faded ‘fascist glory’. Well, perhaps because, despite all the academic polishing, the Thyssen reputation continues to rust. Perhaps because our seminal book has obliged the Fritz Thyssen Foundation-funded academics to admit more than the Zichy-Thyssen family is prepared to accept, without protest. And perhaps because ‘I Paid Hitler’ can once again resume its vainglorious objectives as a tool of Thyssen propaganda.